Bogota, August 10 2015(FNC Press) – The Colombian Coffee Growers Federation (FNC) is making steady progress in meeting the objectives outlined in its 2015-2020 Strategic Plan. Approved by Colombia’s coffee growers during the National Congress of Coffee Growers, the Strategic Plan is the road map for achieving the coffee industry we want in the upcoming five years. The current Strategic Plan seeks to achieve a sustainable coffee industry through four key areas: economic, social, environmental and institutional. Below are some of the key performance indicators of the Strategic Plan during the first semester of 2015. From an economic standpoint, the FNC Strategic Plan seeks to achieve three key objectives: further increase productivity, manage and reduce production costs, and add value to the producers’ harvest in order to enhance the competitiveness of Colombian producers. o As of July 31st 2015, a total of 38,272 coffee growing hectares had been renovated (16% more than those renovated between January and June 2014). 61% of them were technologically advanced young crops (23,379 hectares), 27% were technologically advanced aged crops (10,230 hectares) and 12% were new crops (4,664 hectares). o A total of 5,711 hectares were renovated thanks to the Permanence Sustainability and Future (PSF) program with 6,256 new credits. o The FNC developed 35 new participatory research plots (PRP) that integrate research, the extension service and the coffee grower. o A total of 6,371 soil analysis were developed in order to help determine the exact amount and type of fertilizer needed to increase a lot’s productivity during the first half of 2015. 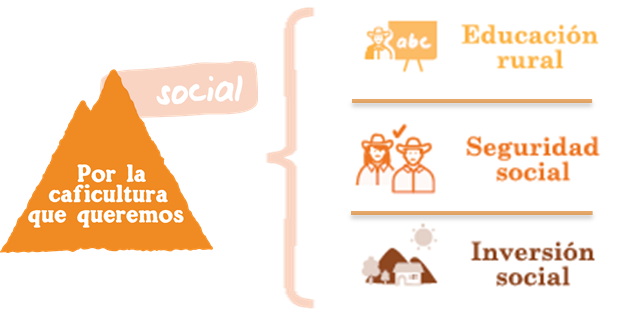 The Strategic Plan’s social area seeks to achieve three key objectives: support the expansion of the rural education models, increase producers’ access to social security, and maintain social investment by strengthening public and private partnerships in order to enhance the quality of life in coffee growing areas. o $2.6 million have been invested in education during the first semester of 2015(6% more in local currency than the investment made between January and June 2014). 86% of these resources were invested in formal education. o The Management Program has benefited 17,835 producers through 4,986 meetings (54% more than those benefited up until June 2014). o 2,601 kilometers of tertiary roads received maintenance. o 124 rural homes were built in 5 departments and a total of 2,740 homes were improved in 6 departments. o A total of $23.3 million were invested in infrastructure (64% in communitarian infrastructure). This represents a 45% increase compared to the same period in 2014. The Strategic Plan’s environmental area seeks to achieve two key objectives: fully implement the FNC’s climate smart coffee growing strategy and manage environmental resources efficiently in order to achieve a coffee industry that adapts and mitigates climate change. o 88% of the total renovated hectares (186 million trees across 34,403 hectares) have been renovated with resistant varieties that are better adapted to climate variability. o 469 hectares were reforested to protect watersheds and forests in seven departments. o $3.7 million were invested in environmental protection through programs including KFW, Smart Water Management (GIA), biodiversity, sanitation, reforestation and ecological stoves. o The average levels of rust (2.1%) and coffee berry borer (1.6%) are now below the economic threshold (5%). The Strategic Plan’s institutional area seeks to achieve three key objectives: implement risk management strategies, strengthen corporate governance policies and ensure the coffee growing model’s financial sustainability. This aims to guarantee that coffee growing institutions will remain a relevant and representative player for Colombian coffee growers. o 47% of Colombia’s coffee growers (259,319) have received the services of the rural extension service. Of this number, 72,294 (28%) were women. o 32,262 coffee growers have participated in institutional activities and gatherings. o A total of 41 women’s associations have been formalized and trained. o 316,373 coffee growers from seventeen departments have saving accounts and the New Smart Coffee Growers ID.